Systec's Pop-Up Infeed Device (PID) is an integral part of the conveyor line. 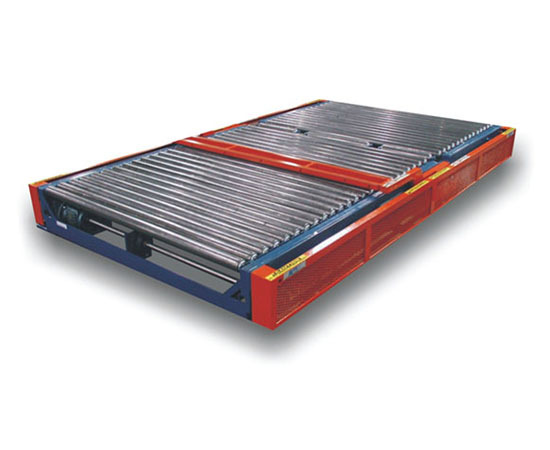 Typically it is used at the end of a conveyor line for transfer of a load off the line, onto a perpendicular conveyor line, or simply off the line onto a pallet, cart, or some other transport method. Systec's Sheet Gripping Device (SGD) can be used at the end of the PID for transferring loads onto deck, or bottom dunnage sheets. The over stroke capabilities of this device ensure the load will not only be transferred fully off the conveyor line but a full 9 inches beyond the end of the line. The PID can be used in Powered Accumulating Roller conveyor (PAR), Powered Roller Only conveyor (PRO), or in Gravity Roller Conveyor (GRC) applications. Based on load sizes, the device will accommodate small and medium size loads in the 72” downstream zone size, or large loads with the 96” downstream zone size device. Unlike other “in-line” transfer devices that leave a large opening in the conveyor line when the devices head is in operation, Systec's PID leaves only a 2” gap. This prevents someone from stepping into the device while in operation, which could result in serious accident and injury. The side cover guards on the PID protect personnel from the moving parts, yet allow maintenance personnel easy viewing of the internal components while doing routine maintenance checks of the conveyors and devices.